Springtime Bug Off Garlic Chewables for Dogs | Natural Flea and Tick Prevention for Dogs | Springtime, Inc. Celebrating over 20 years of natural bug protection! 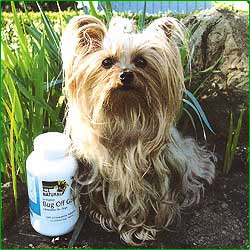 Springtime Bug Off Garlic Chewables for Dogs is a safe, natural, flea and tick repellent. Liver flavored Bug Off Garlic Chewable tablets are convenient and easy-to-give. Provides a 24-hour shield against fleas, ticks, flies, mosquitoes, etc. • A 24-hour shield against fleas, ticks, mosquitoes, gnats, etc. Veterinarians versed in natural alternatives use garlic in their private practices throughout the world. Although best known for its health protective properties, garlic has been used for centuries as an insect repellent. Springtime's air-dried garlic takes that benefit to a new level and is far safer than many chemical products. You may use this product with total confidence. Recommended to help deter biting insects, such as fleas, ticks, mosquitoes, and gnats. Directions for Use: Initial Dose: Introduce gradually over the first few days by using a fraction of the Maintenance Dose. Do not be discouraged if your dog does not take to the change immediately. Once the Maintenance Dose is achieved, it may take 2-4 weeks to maximize protection. Tablets may be broken into pieces. Year-round use is recommended. Double or triple doses are recommended for areas of high infestation as is increasing the dosage in the spring and fall when insects tend to surge. Variances on color and aroma from batch to batch are normal. Inactive ingredients: Dextrose, desiccated beef liver, microcrystalline cellulose, and stearic acid. Safe use in pregnant animals or animals intended for breeding has not been proven. If animal's condition worsens or does not improve, stop product administration and consult your veterinarian. Should not be used prior in pre-existing anemia or prior to surgery. Federal law prohibits the off-label use of this product in ruminants. A Japanese study* proves that garlic toxicity is almost impossible to reach. Result - Microscopic examination of subject dogs' blood showed oxidative damage to a small percentage of red blood cells. No dog was anemic. No dog was reported to show sickness, weakness, or other negative signs. Researchers guessed that continued feeding would eventually cause anemia. *Lee, K.W., Yamato, O., Tajima, M., Kuraoka, M., Omae, S., Meade,Y. "Hematologic changes associated with the appearance of eccentrocytes after intragastric administration of garlic extracts to dogs. "American Journal of Veterinary Research. November 2000. Vol. 61, No. 11, 1446-1450. • Springtime, Inc. is not affiliated in any way, shape, or form with the researchers or publishers of this study. Conclusion - In my opinion, it is extremely unlikely that any dog would ever voluntarily eat the amount of raw garlic necessary to reach the minimum toxic dose. Most natural veterinarians who recommend feeding raw garlic stay well under 10% of that amount. Bug Off Garlic air-dried powder is virtually impossible to overfeed. Raw garlic contains about eight times the amount of allicin (oxidative compound)** found in air-dried garlic powder. Increasing the dose eight times means you'd have to feed more than 4 lbs of Bug Off Garlic per 100 lbs of body weight per day. Normal usage is less than 1% of that amount. Bug Off Garlic is absolutely safe for everyday, year round use. Dennis Hampt, Owner/President of Springtime since 1979. **Pearson, Wendy. "Garlic (Allium Sativum) for Horses: In Vitro Antibacterial Activity and In Vivo Toxicity." Professor M.I. Lindinger. University of Guelph, 2003. A central concept of toxicology is that effects are dose-dependent; even water can lead to water intoxication when taken in large enough doses, whereas for even a very toxic substance such as snake venom there is a dose below which there is no detectable toxic effect. Garlic: The Science and Therapeutic Application of Allium sativum L. and Related Species Second Ed. Heinrich P. Koch, Ph.D., M.Pharm. Williams & Wilkens, Baltimore, Maryland, 1996. Banerji, A., Amonkar, S.V., and Bhabha Atomic Res. Ctr. (1978) Insecticidal properties of garlic. India. Patent 144 278. Chem. Abst. 92 (1980) 17 188. Bhuyan, M., Saxena, B.N., and Rao, K.M. (1974) Repellent properties of iol fraction of garlic. Allium sativum Linn. Indian J. Exp. Bio. 12:575-576. Sakai, I. (1992b) Allicin-containing pesticide for golf course greens. Japan. Patent 92 05 211. Chem. Abst. 116 (1992) 168 344. Population Studies - Low cancer rates associated with regular garlic consumption. Dorant, E., van den Brandt. P.A., and Goldbohm, R.A. (1994b) A prospective cohort study on Allium vegetable consumption, garlic supplement use, and the risk of lung carcinoma in the Netherlands. Cancer Res. 54:6148-6153. Yang, C.S., Wang, Z.Y., and Hong, J.Y., (1994b) Inhibition of tumorigenesis by chemicals from garlic and tea. In: Advances in experimental medicine and biology: diet and cancer: markers, prevention, and treatment. M.M. Jacobs, ed. Plenum, New York, pp. 113-122. Chem. Abst. 122 (1995) 22 889. Caldwell, D.R. and Danzer, C.J. (1988) Effects of allyl sulfides on the growth of predominant gut anaerobes. Curr. Microbiol. 16:237-241. Chem. Abst. 108 (1988) 146 953. Abdullah, T.H., Kandil, O., Elkadi, A., and Carter, J. (1988) Garlic revisited: therapeutic for the major diseases of our times? J. Nat. Med. Assoc. 80:439-445. Chem. Abst. 109 (1988) 21 973. Int. Pharm. Abst. 26 (1989) 2286. Nakata, T. (1973) Effects of fresh garlic extract on tumor growth. Nippon Eiseigaku Zasshi (Jap. J. Hyg.) 27:538-543. Chem. Abst. 79 (1973) 111 680 (Japanese). Nakata, T., and Fujiwara, M. (1975) Adjuvent action of garlic sugar solu-tion in animals immunized with Ehrlich ascites tumor cells attenuated with allicin. Gann 66:417-419. Weisberger, A.S., and Pensky, J. (1957) Tumor-inhibiting effects derived from an active principle of garlic (Allium sativum). Science 126:1112-1114. Kametani, T., Fukumoto, K., and Umezawa, O. (1959) Studies on anticancer agents. I. Synthesis of various alkyl thiosulfinates and tumor-inhibiting effect. Yakugaku Kenkyu (Jap. J. Pharm. Chem.) 31:60-74. Chem. Abst. 54 (1960) 11 018 (Japanese). Hirsch, A.F., Piantadosi, C., and Irvin, J.L. (1965) Potential anticancer agents. II. The synthesis of some nitrogen mustard containing sulfones and thiosulfinates. J. Med. Chem. 8:10-14. Chem. Abst. 62 (1965) 5215. Cheng, H.H. and Tung, T.C. (1981) Effect of allithiamine on sarcoma-180 tumor growth in mice. Taiwan I Hsuch Hui Tsa Chih 80:385-393. Chem. Abst. 95 (1981) 197 366 (Chinese). Di Paolo, J.A. and Carruthers, C. (1960) The effect of allicin from garlic on tumor growth. Cancer Res. 20:431-434. Chem. Abst. 55 (1961) 3844. Kimura, Y. and Yamamoto, K. (1964) Cytological effect of chemicals on tumors: influence of crude extracts from garlic and some related species on MTK-sarcoma III. Gann 55:325-329. Chem. Abst. 63 (1965) 1089. Fujiwara, M. and Natata, T. (1967) Induction of tumor immunity with tumor cells treated with extract of garlic (Allium sativum). Nature 216:83-84. Lau, B.H.S., Woolley, J.L., Marsh, C.L., Barker, G.R., Koobs, D.H., and Torrey, R.R. (1986a) Superiority of intralesional immunotherapy with Corynebacterium parvum and Allium sativum in control of murine transitional cell carcinoma. J. Urol. 136:701-705. Jacob, R., Isensee, H., Rietz, B., Makdessi, S., and Sweiden, H. (1993a) Cardioprotection by dietary interventions in animal experiments: effect of garlic and various dietary oils under the conditions of experimental infarction. Pharm. Pharmacol. Lett. 3:124-127. Chem. Abst. 123. (1994) 162 425. Torok, B., Belagyi, J., Rietz, B., and Jacob, R. (1994) Effectiveness of garlic on the radical activity in radical generating systems. Hanafy, M.S.M., Shalaby, S.M., El Fouly, M.A.A., El Aziz, M.I.A., and Soliman, F.A. (1994) Effect of garlic on lead contents in chicken tissues. Dtsch. Tieraeztl. Wochenschr. 101:157-158. Cha, C.W. (1987) A study on the effect of garlic to the heavy metal poisoning of rats. J. Korean Med. Sci. 2:213-223. Chem. Abst. 109 (1988) 18 322. Many natural veterinarians choose Bug Off Garlic for absolute safety, healthy benefits, and greatest insect repellent properties. hiding, shivering, convulsions, and skin irritation. consult with your veterinarian immediately. NEWARK, N.J., Dec. 8, 2011 /PRNewswire via COMTEX/ — There is a growing sense of moral outrage and alarming statistics from consumers and pet advocates alike after over 75,000 complaints about the products have been reported to the EPA and nothing has been done to change the advertising, marketing or labeling of the products to alert pet owners of the possible serious side-effects. What's chilling is that those numbers only reflect what has been reported, the actual number of incidents may be much, much higher. P.T. Barnum says, "Pesticides are good for your pets; beware of natural foods and herbs!" "There are two kinds of statistics; the kind you look up, and the kind you make up." Garlic has been given to both humans and animals medicinally for more than 4,000 years. A study conducted by the National Cancer Institute found garlic to be an effective inhibitor in the growth of cancer cells. Garlic can help rebuild the immune system and is a good remedy for the prevention of fleas. Selenium, a component of garlic, acts as an antioxidant and activates enzymes which may protect against cancer. Veterinary surgeon Buster Loyd-Jones achieved "spectacular" results by giving garlic to dogs. For more information or to purchase a copy of the book please visit www.innertraditions.com. Feed your pet a balanced natural diet. 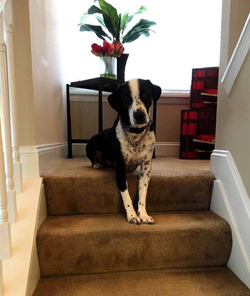 Take control of home & lawn chemicals your pet may be exposed to. Lower your stress – it will help lower your pet's stress, too. Spend more time with your pet, they need our love and care. 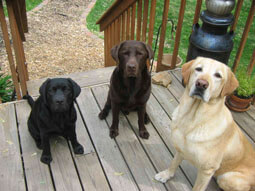 Feed Bug Off Garlic and/or Longevity daily to detoxify & protect your pet. and, some 70 types of cancer have been identified in domestic animals. "Farnum's Bio-Spot® Flea & Tick Almost Killed Our Dog"
"Poisons on Pets – Health Hazards from Flea and Tick Products"
"Chemical Flea and Tick Product Warning per Environmental Protection Agency and the American Veterinary Medical Association"
"What You May Not Know About Flea Products"
"Illnesses Associated with Occupational Use of Flea-Control Products – California, Texas, and Washington, 1989-1997"
"Poison in the Grass: The Hazards and Consequences of Lawn Pesticides"
"Your Garage Can Be a Dangerous Place!" All animal feed products in the United States are regulated by a national organization called the Association of American Feed Control Officials, Inc. (AAFCO). AAFCO, composed of each state's agricultural department officials, is responsible for monitoring safety issues regarding feeds and supplements. AAFCO prohibits substances that may harm and lists approved ingredients with a proven safety history. Such items are called GRAS (generally recognized as safe), and are listed in AAFCO's Official Publication. Garlic is one of the many natural foods and herbs which have earned the GRAS status by having a clean and clear history of use. AAFCO gathers information from many sources (for example, professional toxicologists from all over the United States) and they really know what they are talking about! So there we have it. Garlic, the world's most popular health tonic, is backed by thousands of years of history and recognized by leading veterinary, regulatory, medical, and scientific organizations. "...garlic supplements may be able to fight off the ticks and hopefully decrease the risk of Lyme disease.."
Tracey, MS, Elizabeth. "Why the Swedish Army Hopes Garlic and 'Lyme' Don't Mix." WebMD Medical News Archive. 15 August 2000. "...our results suggest that garlic may be considered as a tick repellent for individuals and populations at high risk for tick bite, rather than other agents that might have more adverse effects." Mercola, MD, Joseph. "Garlic Keeps the Ticks Away." "...there were...fewer tick bites among those that took garlic..."
Brignall, ND, Matt. "Garlic Repels Ticks." Better Health News Archive Index. 24 August 2000. A Natural Mosquito Repellent – Garlic for Mosquito Control Why Does Garlic Repel Mosquitoes? "It's not clear why garlic should be an effective mosquito repellent. It would seem that the powerful compounds such as allicin which garlic releases are inimical to mosquitoes. They have therefore evolved to avoid garlic. Another possibility is that the strong smell of garlic overwhelms the mosquito's sense of smell and prevents them from finding the prey (us! )...Whatever the mechanism, garlic's ability to repel a variety of pests has been proven scientifically." Mendham, Trevor. "A Natural Mosquito Repellent: Garlic for Mosquito Control." is a special grade of garlic that has been low temperature dried (air-dried), and carefully stored and handled to retain the highest level of bug repellent potency. It produces a garlic odor more powerful than any other variety we have found. Parasitic insects have a sense of smell that can be up to 10,000 times more sensitive than a human's. Garlic's unique, pungent odor acts as one of its several defenses against insects and other pests. Yet, the garlic odor itself is mostly noticeable to humans only at feeding time. In recent years, there have been several crop spray products made from garlic that prove garlic's ability to repel insects. The U.S. Environmental Protection Agency (EPA) considers these products so safe that a special "fast track" registration is allowed for them because of their low risk status. Veterinarians versed in natural alternatives use garlic in their private practices throughout the world. While best known for its health protective properties, garlic has been used for centuries as an insect repellent. Springtime's air-dried garlic takes that benefit to a new level and is far safer than many chemical products. You may use this product with total confidence. Year round, long-term use is absolutely safe and highly recommended! 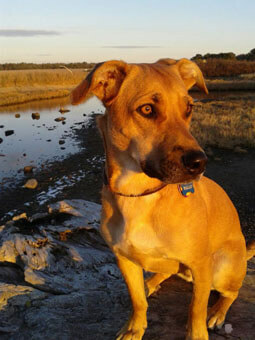 I started giving my dog, Wally, Bug Off Garlic Chewables earlier this spring before ticks became an issue. Wally goes everywhere with me. We go on daily trail walks and hikes in areas infested with ticks. I'd previously been using Frontline Plus on him, but it wasn't lasting the 30 days it was supposed to. My vet said in order for it to work well on Wally I'd need to apply a treatment once every two weeks! This simply was not going to work, so I began looking for alternative ways to keep Wally flea and tick free year round. I'm so glad I found Springtime, and since starting Bug Off Garlic Chewables Wally hasn't had any ticks! As further proof of how well Bug Off Garlic Chewables works, I recently took Wally and my father's two dogs (a Lab and a Yorkie) out for a hike in the woods. Wally gets 6 Bug Off Garlic Chewables a day. The Lab is on Frontline Plus and wears a Scalibor flea & tick collar, and the Yorkie only gets Frontline Plus treatments. Guess which dog had absolutely no ticks when we got home? That's right, Wally was completely tick-free, while both of my dad's dogs had numerous ticks on them. Thanks again for such a great product! Kona got the vet’s “all clear” from bugs. Kona got the vet's "all clear" from bugs. I just went to a new holistic vet and got the "all clear" for Kona. No bugs. However, the vet recommended a flea and tick prevention treatment anyway. I reminded them that I use Bug Off Garlic Chewables and asked, "Did you find any fleas or ticks on her?" They said no. So I asked, "The heartworm test was negative, right?" And they said yes. "Well, ok then!" Bugs, including mosquitoes, stay away from both my dogs, Kona and Callie. And, we go to the local park regularly! I'm overly careful with my girls as I've rescued one in the past who came to me with heartworm and suffered greatly from the kill treatment into her spine. Great company and products! No More Harsh Chemical Flea & Tick Treatments! Our family has been using Springtime products for over 20 years, and we keep coming back for more. We swear by the Bug Off Garlic Chewables. They have allowed us to completely move away from harsh chemical flea and tick treatments. We have five dogs in our home, and we haven't had a flea or tick issue. I think my son and I are the only ones who have had a tick on us! Perhaps we should take Bug Off Garlic Chewables, too! We keep trying to get our family and friends to give the pills a try. So many people have been brainwashed into thinking they need to treat their dogs with chemicals to have success, and it's simply not true. So I am writing to say thanks! Your products have allowed our dogs to live longer, healthier, happier lives and for that we are grateful! Fancy and her bottle of Bug Off Garlic. Fancy, our 8 year old Yorkie, suffered from flea bites that left her skin raw and bleeding despite everything we tried. Usual flea control methods such as collars and drops produced problems – and didn't seem to bother the fleas. Then a year ago, Bug Off Garlic Chewables caught our eye in an advertisement. Skeptical, I said, "Probably bogus. But the price is reasonable; let's try it. Nothing else works." In the year since, no fleas, no scratching, no raw skin. The only side effect is, Fancy's breath can knock a buzzard off of a brick outhouse for a few minutes after her nightly dose of Bug Off Garlic Chewables. Thank you, Springtime! Joy herding the sheep of Hado-Bar Farm. "Both the dogs and the sheep LOVE their Bug Off Garlic!" I began giving the Bug Off Garlic products to my dogs (a Border Collie named Joy, an Australian Shepherd named Dixie, and a Whippet named Zoom Zoom) and to my flock of sheep in March of this year (2016). I feed the dogs the Bug Off Garlic Chewables (mixed in their feed each morning) and mix the Bug Off Garlic with the mineral salt ration that the sheep receive two or three times each week. Both the dogs and the sheep LOVE their Bug Off Garlic! Then, I ran out of the granules about a month ago. 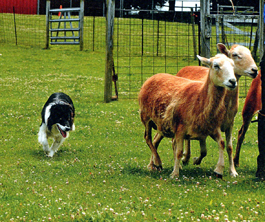 I'm a Stockdog (Herding) Trainer and my sheep (73 of them – mostly Barbados Blackbelly hair sheep) are used for training and herding events here at the farm. As a result, the sheep spend a considerable amount of time out of the barn during the "buggiest" time of day. I noticed the sheep were "dancing" and running around with their heads down to avoid pests. They needed their Bug Off Garlic --- AND SOON! My order arrived today (28 June). The sheep practically inhaled their mineral salt "laced" with Bug Off Garlic this afternoon! Hopefully, they'll be "bug-proof" again, soon!